In the world of academic integrity, there are all kinds of scams that students (and the universities they’re associated with) have to watch out for. Some of these scams, such as the potential to be blackmailed by a contract cheating provider, are dangerous. The fake scholarship scam is less likely to lead to blackmail than using an essay mill, but it can waste people’s time with little prospect of a return. There are dangers of personal information being shared. And, if you’re a student who successfully gains a scholarship, you might just end up with your picture plastered all over a website you’re not keen to be associated with – not good for your long term professional online presence! These are the type of scholarship offers that you need to be wary of. Those examples were taken straight from a list on a legitimate educational website. I deliberately haven’t linked to the site, but you can easily find many other such lists through a quick Internet search. Information about this scam is widely available in underground Internet forums. 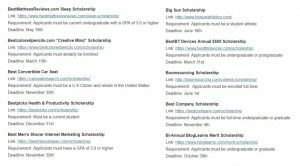 A company (usually a new website wanting more visitors) sets up a scholarship offer. This will be for a low amount of money, say a one-off payment of $500 USD. They set up a page on their site advertising the scholarship, along with a set of conditions that a student has to meet to be eligible. This might, for example, relate to their academic performance, background or where they live. These conditions will be so tight that not many people are eligible to take part. They’ll also set up qualifying criteria, such as for the student to write a 1000 word essay that relates to the site or the product it sells. Most importantly, the student, when applying, gives permission for their likeness and application to be used by the site, regardless if they win the scholarship or not. What Does The Scholarship Scamming Company Get Out Of This? First of all, the company gets links to their scholarship placed on university websites. Universities want to promote scholarships to their students. This is a scholarship offer, just not of the same standard as many others, but it is difficult for universities to make a decision regarding which scholarships their students should be allowed to apply to. Hence, many of these links get accepted. Just having a link from a respectable university site automatically makes the site being promoted seem more legitimate. That is reflected in many search engine ranking algorithms. A higher ranking site means more visitors and more sales. The scholarship company also gets all of the entries from students which they can use how they want. They own that content. So, if they get 100 students applying for their $500 scholarship and submitting a 1000 word essay, they are paying only $5 to publish each 1000 word essay. That’s before the value of the links. And, with that, they get to use all the student likenesses in their marketing. Often, the $500 will not even be awarded. That’s because none of the students meet the qualifying criteria. Or the student that is selected fails to meet some later requirement, such as providing proof of their course or a suitable recommendation letter. 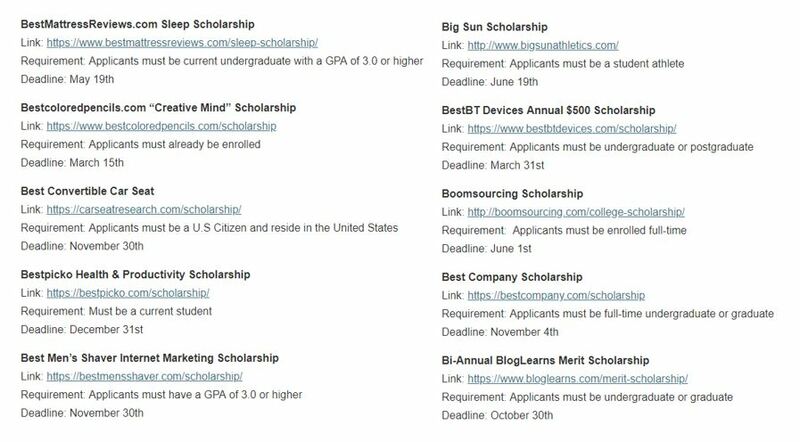 Some of these sites do not ever intend to award a scholarship. They just invent a winner name and use a photo of a person which can be reverse image searched to lots of websites (a similar technique used by many essay mills to provide fake testimonials). There are so many university scams out there. It is a case of being aware. We need to remind staff and students alike not to accept everything at face value. Scholarship scams are big business. There are even companies that will set up a scholarship page, along with all the educational links, as a service, or which will provide flyers about the fake scholarships to bring in even more business. When combined with such issues as fake certificates and fake degrees, there’s a growing world of fake education that we have to be prepared for.